What are your earliest memories of golf? It was a mixture of my dad and my friends who got me into golf when I was 12. I used to play football up until then, but Worthing Golf Club had a really big junior section, so I used to go up there at the weekends and play in competitions. I got hooked. How quickly did you realise golf could be your career? I got into the Sussex County under-14 side, but I was a late developer. I won the Sussex under-18s title when I was 17, which obviously isn’t a huge national one, but it’s big in the south. Then I slowly got better and better and probably improved the most between 20 and 25 years old. I was pretty good as a junior, but not the best and I wasn’t playing national competitions. Then I decided to go to America when I was 18. What prompted your decision to move across the Atlantic? I knew my golf would get better over there because I’d have the weather, facilities and competition. And I knew I had the work ethic to do it. I also wanted the experience and to get a degree at the same time. I worked really hard and my confidence grew and grew and I improved steadily every year. What were the key things you learnt and developed at college in America? Competitive play. I learnt how to score as best as I could even if I didn’t have my A game. The tournaments are very competitive out there week in and week out and you can’t afford to get in a rut and start thinking too much about technique – you just have to score well. I learnt more about my technique as well and developed more shots to I could hit it higher and lower and shape it both ways better. I learnt to chip and putt a lot more consistently too. Did you notice a difference with the peers you’d left when you came back to the UK? I won a big competition in my third year in the States and I remember coming home with a different mindset. I wasn’t there to make up the numbers in big competition in the UK anymore; I was there to win. My expectations increased and I think that’s really important in this game. What were your expectations when you turn pro? My big goal was to get on the European Tour by 2016 – and that’s still the aim. I’ve eased into the pro game. In my first year in 2013 I played mini tour events in the south to get some confidence and get used to playing for money. I did well and won three events – that was good for my confidence. This year (2014) was my first on the EuroPro Tour and I’m gradually improving and moving up step by step. Were you worried when you missed your first three cuts on the EuroPro Tour this season? I’d had such a good January to April that I was still fairly confident even when I missed the cuts. My training had been really good in Florida and I’d won the First Stage of EuroPro Q School and shot a course record in that. It just took a little while to get used to playing on the EuroPro Tour but as soon as I made a cut my expectations increased again. Then you make a top 20, and a top 10 and you get used to it. I felt I was ready to win by August. You got back-to-back wins at Prince’s and at The Oxfordshire. 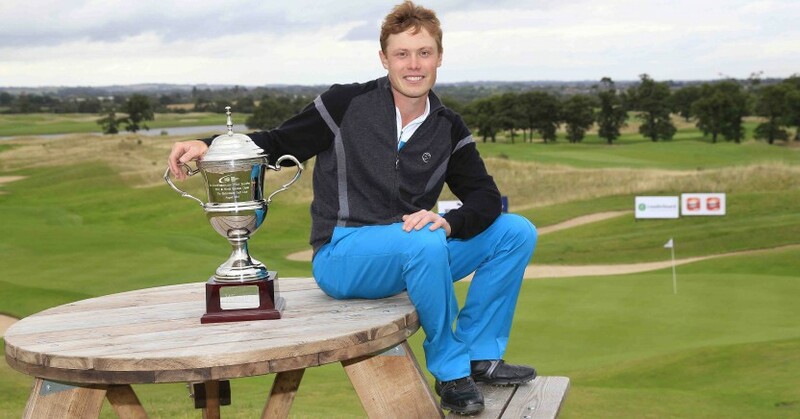 How important was it to win in your first year on the EuroPro? It’s really important for self-belief and feeling like you belong there. It was like a weight had been lifted off my shoulders when I turned up at The Oxfordshire and before you know it you’re in contention again. Everyone’s got to win for the first time, but you’ve got to take yourself out of your comfort zone to do it. How important was it for you to take on a full-time caddie? It was a risk. Nigel used to caddie on the Ladies European Tour and he had a free month so I asked him if we could work together. I couldn’t afford to pay his way because I was struggling to cover my own expenses but he said we could do a month and go from there. You’ve just got to look at my results to see what a difference it made and more guys on the tour are starting to think it’s worth the investment. Who else are the key players in your support team? My coach, Steven Orr, is brilliant. He helps me with my mental game as well as my technique and swing drills. We’ve worked a lot on the way I practice and how I plan my weeks. It’s important for me to work on the right things. I practice more short game than long game and the wedges and putting are really important for me. I’ve got a small family-based management team and they can organise things for me. Worthing Golf Club has been great and they’re always very supportive. The members have been to watch me at a lot of tournaments. I have a great team and it’s really important for my progression. What are you working on this winter ahead of making the step up to the Challenge Tour? I’m going to Spain in January, so I’ll have two months to work on everything over there. I want to stay competitive and I like playing tournaments and cash games so I’m focused on my scoring. I don’t like to get too bogged down with swing changes and thoughts. I want to get more powerful and flexible in the gym so I’ll be working on that. I’m swinging it so well that I want to get all the figures of my swing recorded so I can look back on what I do when I’m swinging well if I do go through a rut. Are you expecting to make a splash and get a win in your rookie Challenge Tour season? Definitely. My goal is to win at least once on the Challenge Tour and in doing so get a top 15 spot that would earn me a place on the European Tour. Another big goal is to qualify for The Open at St Andrews.